Steve Bannon was scheduled to headline the star-studded The New Yorker Festival, but the magazine said it uninvited him after participants, including comedians Jim Carrey and John Mulaney, threatened to back out. (NEW YORK) — The New Yorker pulled Steve Bannon from its annual fall festival on Monday amid major pushback from staff and celebrity participants. Bannon, President Donald Trump’s former chief strategist, was scheduled to headline the star-studded The New Yorker Festival, but the magazine said it uninvited him after participants, including comedians Jim Carrey and John Mulaney, threatened to back out. “I don’t want well-meaning readers and staff members to think that I’ve ignored their concerns. I’ve thought this through and talked to colleagues –– and I’ve re-considered. I’ve changed my mind. There is a better way to do this,” New Yorker editor David Remnick wrote in a statement Monday. The weekly magazine had planned to interview Bannon, which it called a leading creator and organizer of “Trumpism,” as a part of the October festival. Critics slammed the decision, saying it would give the ex-White House staffer a platform to “propel further the ‘ideas’ of white nationalism, racism, anti-Semitism, and illiberalism,” as described by Remnick’s statement. Remnick pulled the ex-White House staffer on Monday evening, just a few hours after the magazine announced that he would participate. “The reaction on social media was critical and a lot of the dismay and anger was directed at me and my decision to engage him,” Remnick said, adding that staff members had also objected to the invitation. “Some on social media have said that there is no point in talking to Bannon because he is no longer in the White House. 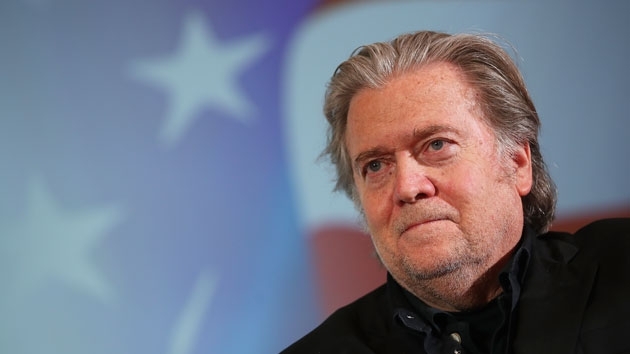 “But Bannon has already exerted enormous impact on Trump; his rhetoric, ideas, and tactics are evident in much of what this President does and says and intends,” he added. Sally Yates, Trump’s ousted deputy attorney general, actresses Emily Blunt and Maggie Gyllenhaal, and a number of musicians, including Kelela and Miguel, are scheduled to speak at the three-day festival, but some participants said they would walk if Bannon appeared. “If Steve Bannon is at the New Yorker festival I am out. I will not take part in an event that normalizes hate. I hope the @NewYorker will do the right thing and cancel the Steve Bannon event. Maybe they should read their own reporting about his ideology,” film producer Judd Apatow said. “I apologize to Susan Morrison as I was really looking forward to our conversation. And I look forward to future @NewYorker Fests & other public, even heated, debates between different voices. But hard pass on this…,” Mulaney said. Comedians Jimmy Fallon, Patton Oswalt and Carrey also said they wouldn’t appear if Bannon was there. The festival kicks off on Oct. 5. Bannon — who left the White House in August 2017 in the wake of a deadly white supremacist rally in Charlottesville, Virginia — blasted the magazine over its “gutless” decision to remove him from the lineup.